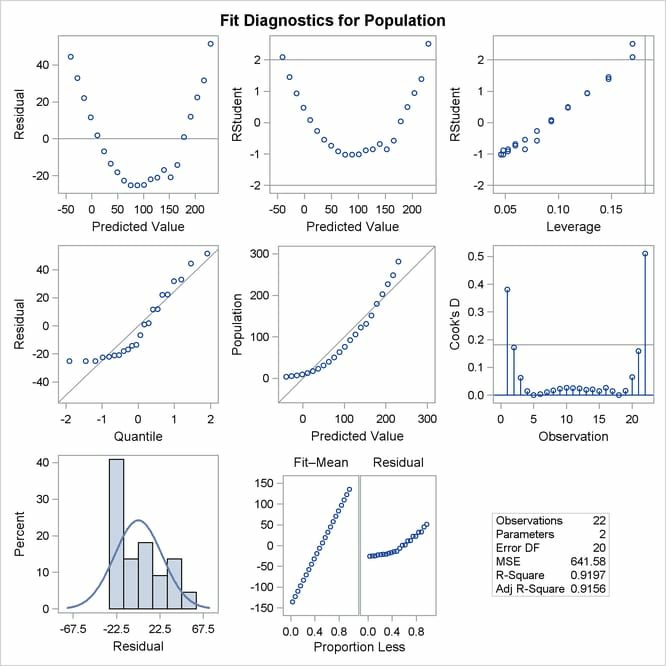 The "Analysis of Variance" and "Parameter Estimates" tables are displayed in Figure 97.5. Figure 97.6 shows the "Output Statistics" table. The residual, its standard error, the studentized residual, and Cook’s D are displayed for each observation. The studentized residual is the residual divided by its standard error. Cook’s D is a measure of the change in the predicted values upon deletion of that observation from the data set; hence, it measures the influence of the observation on the estimated regression coefficients. 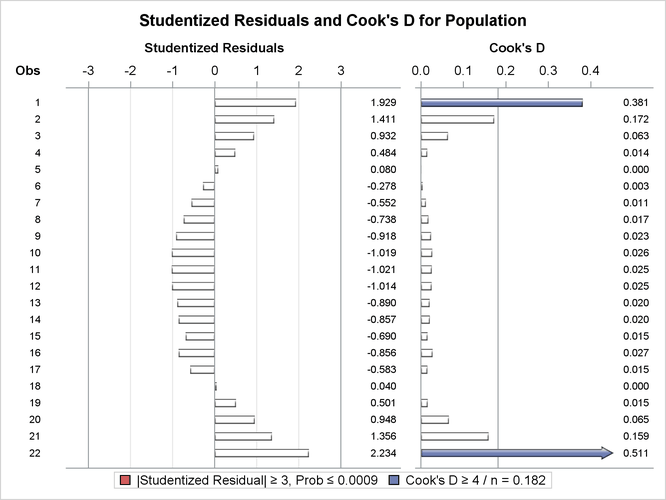 The studentized residuals and Cook’s D statistics are displayed in Figure 97.7. Having a few large absolute studentized residuals is no cause for alarm. Many observations having absolute studentized residuals greater than two might indicate an inadequate model. Absolute studentized residuals greater than three are rarer; they should be regarded as extreme, and the data should be reviewed carefully. Figure 97.8 shows the residual statistics table. A fairly close agreement between the PRESS statistic (see Table 97.7) and the sum of squared residuals indicates that the MSE is a reasonable measure of the predictive accuracy of the fitted model (Neter, Wasserman, and Kutner 1990). Graphical representations are very helpful in interpreting the information in the "Output Statistics" table. 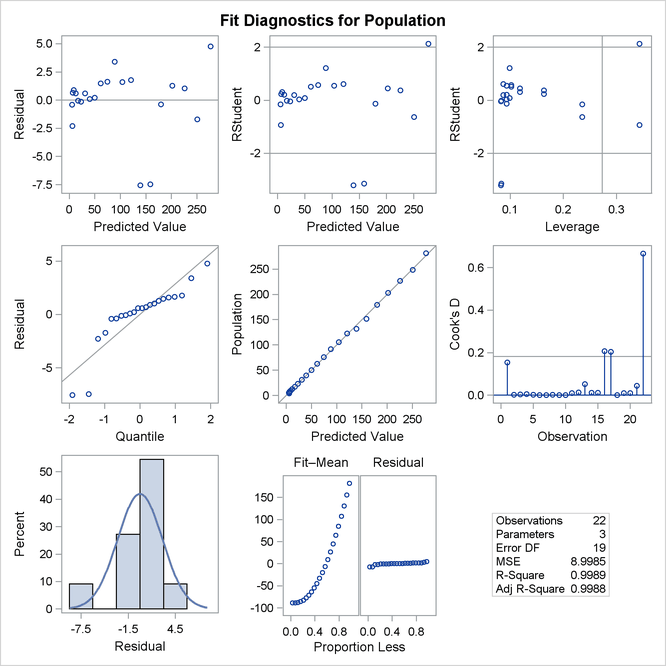 When ODS Graphics is enabled, the REG procedure produces a default set of diagnostic plots that are appropriate for the requested analysis. The "Residual-Fit" (or RF) plot consisting of side-by-side quantile plots of the centered fit and the residuals shows that the spread in the residuals is no greater than the spread in the centered fit. For inappropriate models, the spread of the residuals in such a plot is often greater than the spread of the centered fit. In this case, the RF plot shows that the linear model does indeed capture the increasing trend in the data, and hence accounts for much of the variation in the response. 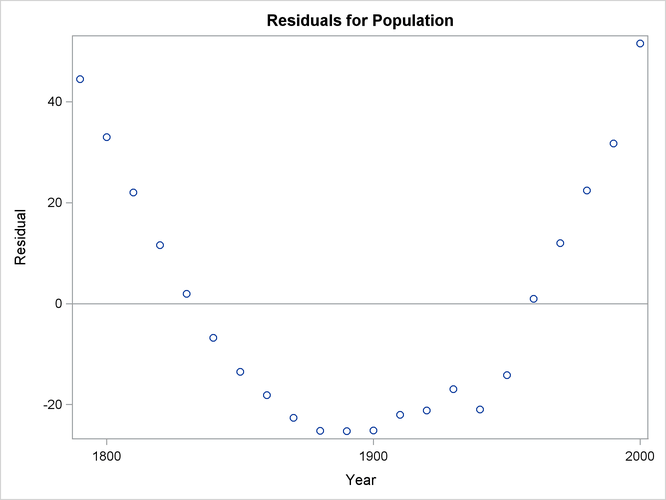 Figure 97.10 shows a plot of residuals versus Year. Again you can see the quadratic pattern that strongly indicates that a quadratic term should be added to the model. 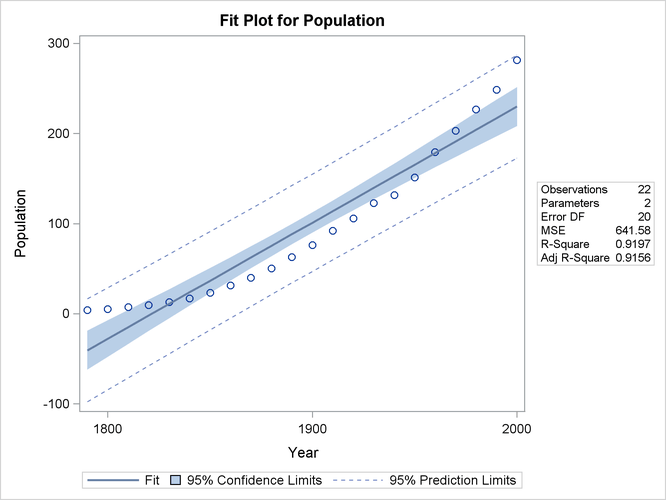 Figure 97.11 shows the FitPlot consisting of a scatter plot of the data overlaid with the regression line, and 95% confidence and prediction limits. Note that this plot also indicates that the model fails to capture the quadratic nature of the data. This plot is produced for models containing a single regressor. You can use the ALPHA= option in the model statement to change the significance level of the confidence band and prediction limits. Figure 97.12 displays the ANOVA table and parameter estimates for the new model. 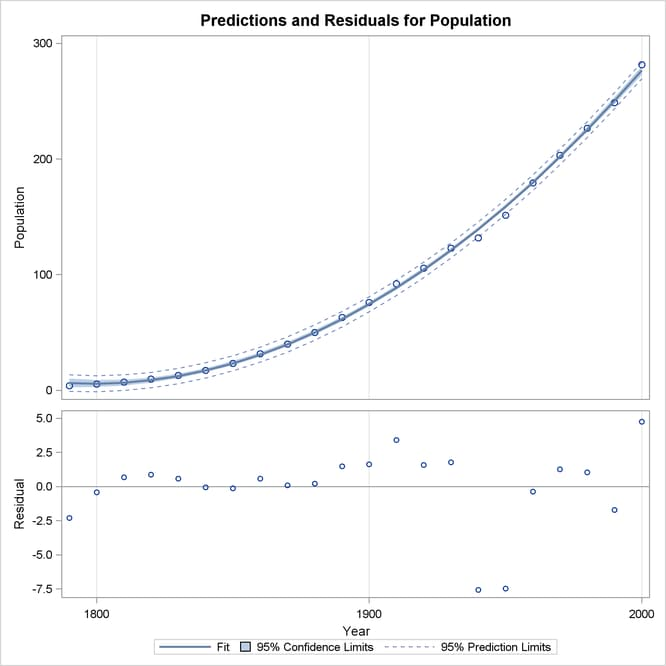 Figure 97.14 shows the data, predictions, and residuals by Year. These plots confirm that the quadratic polynomial model successfully model the growth in U.S. population between the years 1780 and 2000.